Download, print, save or send this handy school holiday calendar so you can start planning for the new year. We here at Parent24 are nothing if not resourceful, and we've got you covered on planning for the new year with our nifty 2018 school holiday printable calendar! Now you can download, save or WhatsApp next year's school holiday calendar and start working out your family getaways for the year ahead. 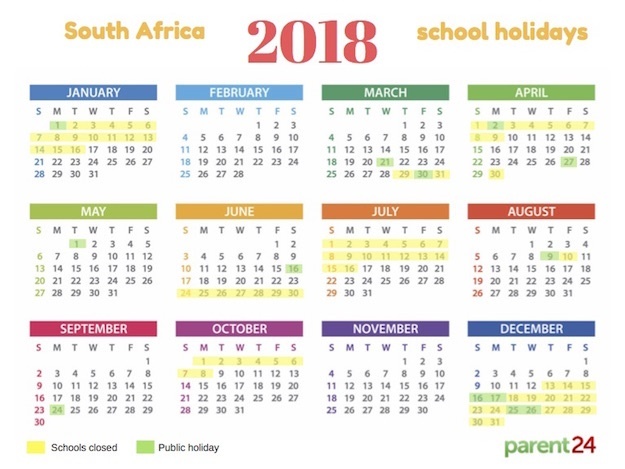 We've indicated all the school holidays in yellow, and public holidays in green. 2018's public holidays don't fall as neatly as they do in 2017, but with a few additional leave days here and there you can maximise your days off. We've taken the liberty to make a few suggestions below! To download the 2018 school holiday calendar, click here. Our guide to the public holidays next year, indicating how many consecutive days you'll get off, and how you can maximise that with a few well-chosen leave days. Monday 1 January is a public holiday. It falls within the December holiday. Wednesday 21 March is a public holiday. Take leave Monday 19 and Tuesday 20 March, or Thursday 22 and Friday 23 March. Friday 30 March is Good Friday, Monday 2 April is Family Day. It falls within the April school holidays. Take leave during the school holiday week, Tuesday 3 to Friday 6 April. Friday 27 April is Freedom Day, Monday 30 April is a school holiday (not public holiday), Tuesday 1 May is Workers' Day. Take off on Monday 30 April. Take leave for a day or two before and/or after the long weekend. For instance, add Thursday 26 April and Wednesday 2 May to the 30th. Thursday 9 August is a public holiday, and Friday 10 August is a school holiday (not public holiday). Take off on 10 August. Also take leave from Monday 6 to Wednesday 8 August. Monday 24 September is a public holiday. This day falls on a Sunday, so Monday 17 December is a public holiday. It falls in the school holidays. Christmas falls on a Tuesday this year, with Day of Goodwill on Wednesday 26 December. It falls in the school holidays. Take leave on Monday 24 December. Bonanza 1: Also take Thursday 27, Friday 28 and Monday 31 off. Bonanza 2: Take leave from 18 to 31 December. Thursday 29 March to Tuesday 9 April (11 working days, 17 total days). Monday 25 June to Monday 16 July (15 working days, 23 total days). Monday 1 October to Monday 8 October (5 working days, 9 total days). *Remember, if you are a teacher, you'll be working for another 2 days at the end of the year, and start 2 days earlier in January. How far in advance do you plan your family holidays? When are you going away and whereto? Send your comments to chatback@parent24.com and we may publish them (anonymously).